According to the study, Arizona keeps getting better in terms of drivers. 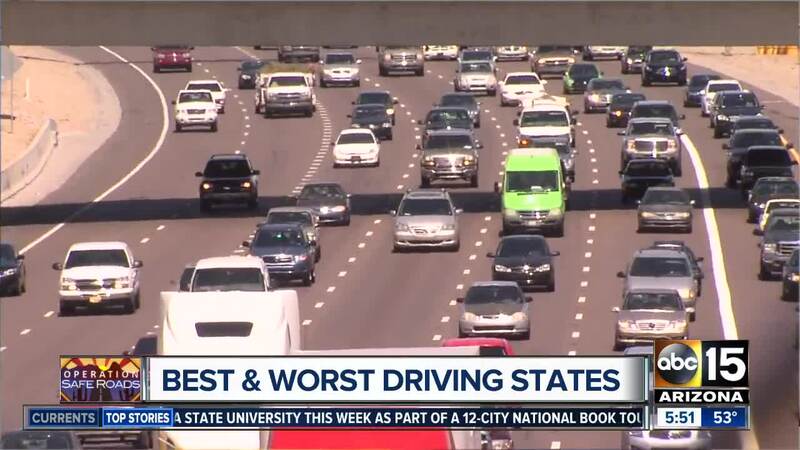 PHOENIX — If you had to take a guess, how do you think Arizona ranks on the roads when it comes to good drivers? According to a new study, our state is actually in the right lane and is ranked in the top 5 best states. The results come from QuoteWizard and their data came from their users, along with information from the Federal Highway Administration . They looked at accidents, speeding tickets, DUIs, citations, and fatalities. These were weighted, with fatalities carrying the most weight. "We take a weighted-sum means and score those and kind of get... an aggregate number," explained QuoteWizard Content Manager Adam Johnson. "And that's how we come together with these rankings." Michigan is ranked number one for best drivers. They are followed by Mississippi and Oklahoma. Arizona then takes the fourth spot with Illinois rounding out the top five. Arizona's next door neighbors in California were on the other side of the list. They were ranked fourth in the worst drivers list. But, these rankings also carry a financial impact. Statistics like these can impact what drivers pay for insurance. "One thing that we do observe with insurance companies is... whether you're in a state where they're really bad drivers, but you have a clean driving record - those bad drivers around you can also impact your car insurance rates," Johnson explained.